So there you go. Absolute monarchy. That’s what it’s all about. A system of governance where the supreme ruler, the king, is accountable to no-one. He has total power over his lands and people. But wait. It’s ‘Kings’ plural. There are of course 11 of these particular Super Kings. So presumably the 11 Super Kings are working as a sort of committee. These Super Kings have absolute power and can do anything they want, provided it’s voted on and there’s a clear majority behind each and every decision. I assume that all this Royal stuff is part of the culture in india, certainly seems strange outside of it with 4 out of 8 teams being in some way sent from above… Still rather that than be one of the gay firemen. Well they look like it to me at least. Chris, the KKR kit is my favourite by some distance. That’s as maybe, but i reckon if they’d been modeled on the Cop or the Builder they’d still be going as well as match #1. The Red Indian was probably best avoided though. 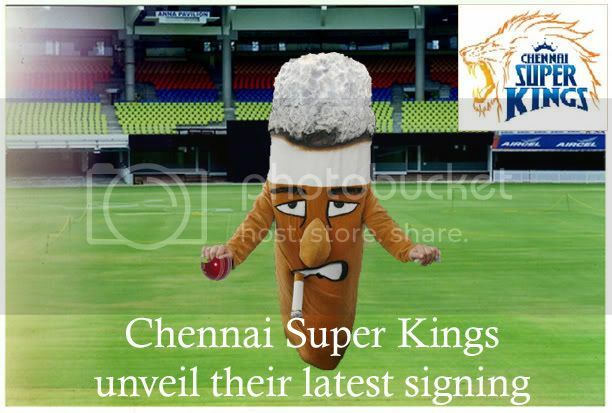 I thought super kings were fags that dinner ladies smoked. i’ve been trawling google for those patch adverts with the walking cigarettes to no avail. If anyone interested would kindly just imagine an 8 foot ciggie chipping a slower ball back to the bowler, that’d be great. thanks. I’ve also just imagined a giant B&H slogging a long hop to the mid-wicket fence. I think I’m going to enjoy this imaginary cricket. I’m just starting my first full game. It’s a 3 day first class affair featuring the Transformers versus the Rock Lords. The Rock Lords won the toss and have decided to bat. We know who we’re supporting. Sorry… Transformers? Autobots or Decepticons? They’ve not gona all lovey-dovey these days have they? I guess they’d be able to use Soundwave to play the boundary tracks, that’s handy. Ironhide is carrying the drinks. We were genuinely worried that Rodimus wasn’t going to earn a spot as we worked our way down the list. He’s a better bat than Unicron – particularly if the ball’s doing a bit. Ha – I was also getting all geared up to say “WHERE THE HECK IS RODIMUS?”. ” the most fearsome and powerful member of the Dinobots” according to wikipedia, although he “can be cold, merciless and contemptuous of those he considers beneath him”, much like Ganguly. How does an entire mechanical planet take guard? What’s the batting line up like for the Rock Lords? However, Pulver Eyes may come in at six if things are going well. There’s probably some kind of rule / equation about exactly how long it takes any given Kingcricket comments thread to turn to Transformers. It should ve been Super Nabobs? I think, Miriam, that such a formula should be David Barry’s next project. I appreciate that things have moved on, but…..
never too late for some suboptimal shoppage. I literally have no idea who the Rock Lords are. I was hoping Mick Jagger et al.. would be playing..
What was I doing when all this was about? I don’t know half of those transformers either. You and me both, hun. Guess we’re just not down wiv da kidz. I’d want Springer in for his point fielding, too. I’m worried that with Omega Supreme, Unicron and Grimlock in the team they may be a bit slow in the field, although obviously Ravage will chase balls all day. I’d have Jazz in for Prowl, to provide the Nixon-esque chatter behind the stumps (or perhaps Wheelie?). Starscream isn’t going to be good for team spirit, either. I hope that when I wake up tomorrow, this parallel universe has returned to normal. I doubt it will have. Not yet anyway, I’m warming to this subject. It occurs to me that Scrounge and his unique arm might make an ideal Murali-esque crafty spinner. Had to ask mrceci to translate most of the above. I now know more than I ever wanted to about Transformers and Rock gods so this is not my fault..
Greetings all, or rather bah-weep-graaaaagnah wheep ni ni bong! Surely you’d want Blurr in any Transformers team. What about a GoBots test XI? Don’t forget Astrotrain – a real express pace bowling option. But enough of this idle speculation – it’s too late to pick the side; we need a match update from Ed. Don’t know much about Go-Bots, after checking Wikipedia I think I’ve been confusing them with Robotix and Zoids. Sorry about the rubbish formatting. Teddy and I Jumped on the train at Crewe and headed towards “cricket central” which happens to be located on the side of a hill once owned by some bloke called Thomas Lord. On the way to London Teddy and I stopped off at Birmingham (so we could get used to people being not so nice). I had a cup of coffee and Teddy had something he liked. We then got back on the train. Teddy and I arrived at the bright lights at 11:30 am (in the morning) and proceded to get a taxi to the ground. The thought of seeing the Rock Lords Versus The Transformers was almost too much for Teddy and me to take. Teddy had to take deep breaths and behave like his analyst told him. And then the umpires came out…….. The moghul era ended a few hundred years ago. Surely no culture. 2 of the teams though – Royal Challengers Bangalore and Rajhastan Royals get their name from the sponsor – “Royal Challenge”, which is the name of the alcoholo brand of UB Group who own the Bangalore team and sponsor the Rajhastan one. Chennai Super Kings – well their largest superstar, a south indian actor by the name of Rajnikant, is referred to as the Super King. And that is cause of Amitabh Bachan being referred to as the King, and someone relplied to that by saying well if hes king, Rajni is the Super King. As for Kings XI Punjab. The Punjabis like to be referred to as lions. Stronger breeds than other mortals. And lions are Kings, thus their name. Even in the ICL the punjabi team is known asChandigarh Lions. However lame, there is a reason behind every pointless team name in the IPL. Thank god for Knight Riders, Daredevils, and Chargers for thinking outside the Indian box. Well i don’t know about no culture because they are extinct… Opal Fruits and Marathon were extinct, but were never forgotten, and now they’re back! So whilst the teams themselves inherited names, those names are still there for the same reasons as if the teams had chosen them completely themselves. But they aren’t really Opal Fruits and Marathons. They are now Starbursts and Snickers. Rubbish names. Or are you exciting me by suggesting the names have reverted? Incidentally, there isn’t a mrsarah at present to translate/explain the Transformers and Rock Gods so I am much more at home with the sweets conversation – hurrah for that! Don’t suppose Spangles have made a return, have they? full on marketing agency gimmick but that’s how life works these days. Surely not the ubiquitous Sarah, Canterbury from the BBC cricket as it happens threads? Just clicked on that link above, Chris, and I am indeed excited! Thank you! Erm, I still go by the name of Sarah mostly. I’m almost as chuffed with Snickers becoming Marathon once more as I am with The Mighty King’s XI Punjab’s recent form. No. Had I been a boy, I am reliably informed that I would have been called Christopher. I have always been quite happy with myself, after getting the odd e mail in on the Guardian OBO, but to find that Sarah Canterbury gets a whole match pretty much dedicated to her, makes me feel slightly less of a person. Though the Beeb site is not as good as the Guardian. Am now feeling very guilty, though do think you’re rather (kindly) over-egging the pudding ref the dedication. Am sure too that you are a jolly nice and completely rounded person. Anyway, take comfort in the fact that with regard to the Beeb site, I fail miserably to get past Tom Fordyce.